We are off to Newport, Rhode Island. Edonna confused the Newport Visitor Center with the Loeb Visitor Center. If you are new to our blog, Edonna and I always follow our wrong turns. 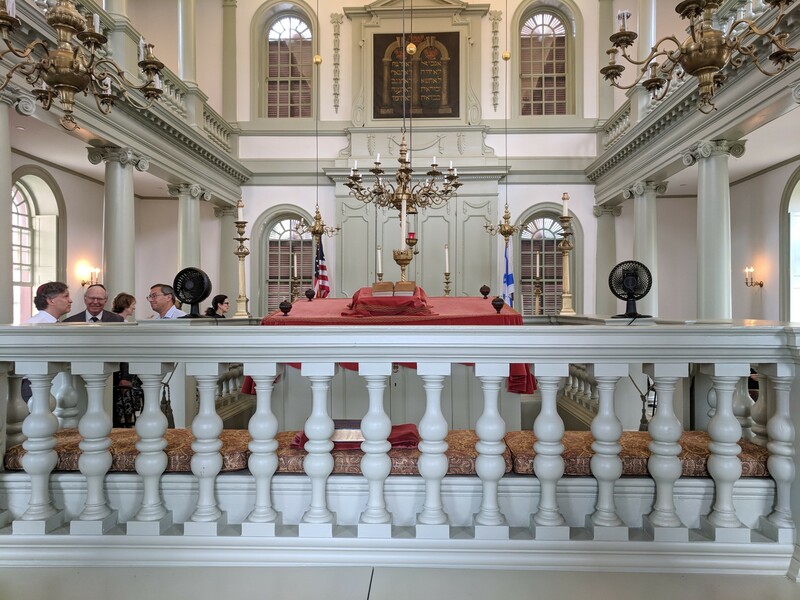 Turned out we were visiting the oldest synagogue in the United States. The congregation is not the oldest but the building is. It was completed in 1763. It is the only synagogue survived intact from the colonial period. We took the tour and our guide, Rachel, told us how the congregation came into being. About 15 merchant families from originally Spain and Portugal came to Newport due to the religious freedom in the town. The founder of Newport was banished from the Massachusetts colony due to his belief that anyone should be free to worship and his commitment to separation of church and state. You can see his influence in the historic areas of town. Many New England towns have the church near or part of the green. Think about New Haven, Connecticut. There are two churches that were built during the colonial that are in the center of the green, while there are a few more churches that are very close to the green. The founders of Newport created their town with government services at the center of town. Religious institutions are part of the outer area with no religion having a dominant space in town. This made Newport very attractive to many minority religious communities. I was glad that our guide did not skirt around the issue of the ‘triangle trade’. These merchants were involved with the slave trade; they got very wealthy off the slave trade. Newport was a major hub for slave trade in the colonial and early America period. Let me describe the inside of the synagogue. The walls are white plaster. There are 12 pillars to represent the twelve tribes of Israel. Each pillar is made from one tree truck. There are beautiful rounded windows. Along the outer wall are prayer benches. This has always been an Orthodox congregation so there is a women’s balcony. There is an attached building where Hebrew school was held. The original Torah is enclosed in a temperature controlled box. It was a stunning piece of work. I was sitting in the third row but could clearly see the lettering. It is believed that the Torah is made from deer hide. I spent a lot of time thinking about this letter today. The messiness we call democracy. This experiment of American government. While Washington was assuring this community that they should not be afraid, Africans were enslaved and continued to fear for safety. It got me thinking about our current political landscape. This letter was part of the basis for the first amendment. George Washington’s letter has been used in many religious freedom cases. How many of you knew this letter existed? Once again, a wrong turn has given me a thought provoking experience. Even in a tourist hot spot you can find an educational experience. 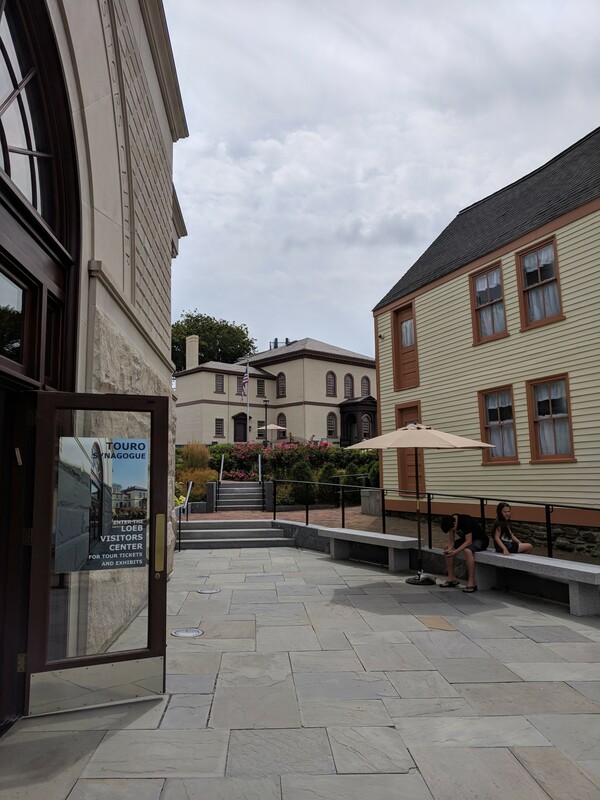 If you are every in Newport, stop over at 52 Spring Street to the Loeb Visitor Center. This experience will stay with me for a long time.